There has been a lot of talk over the last few months about the new allergen regulations that become effective from Saturday 13th December 2014. This is not my normal type of post, but I had to say something on the upcoming allergen regulations. I believe they are really important and could be a huge step forward for the allergy community. Personally, I am absolutely delighted that these regulations are coming in. My worst nightmare is a menu that is not marked in a restaurant. It means that I have to ask what I can have, generally the server has to go check with the kitchen, recount the information to me, and then, I have to remember what those options were because the server, more often than not, has reamed the information off at me in one breath. If I dare ask them to repeat it, it is a big deal. Overall, printed allergen information on menus is convenient for everyone involved. So, what does the new legislation mean? There are many, many types of allergies, but the new legislation by the EU Food Information for Consumers declares that 14 of the most prevalent allergies must be highlighted on menus and packaging. What are these 14 allergens? An allergen is something that causes a reaction from the body. What happens when an allergen causes a reaction? Not all allergens cause the same reactions; the reaction can be anaphylactic or autoimmune. In the case of an anaphylactic reaction the person will need an epipen or an antihistamine, depending on the level of their allergy. As for an autoimmune reaction, they can differ depending on the sufferer and have long-term side effects if the allergen is repeatedly taken. How many people suffer from allergies in Ireland? There is not really any solid statistics. It has been reported that 3–4% of the population suffer from some type of allergy, but there are a lot of conflicting information that suggests a much higher percentage of he population. Unfortunately, allergies are on the rise. This could be due to an actual increase in allergies or it could be that people are growing increasingly more aware of their own allergies and diagnosis. What types of places have to display the allergen information? Restaurants, takeaways, hospitals, contract caterers, hotels, B&B’s, crèches, schools, nursing homes, psychiatric institutions, food stalls, detention centres, and any business that offers meals services. Where do these institutions have to display this? The regulations states: "Food allergen information can be communicated verbally at any time. However, the minimum requirement set out in the national measures is that written food allergen information is provided to the consumer or mass caterer. The written information must be presented in at least the English language and be easily located and accessible. It must clearly identify the allergens contained in a food or beverage in legible hand written or printed format." Restaurants can mark their menus or clearly mark on a chalkboard with their specials. Additionally, they can provide a separate menu or listing to customers. All information has to be accessible. It cannot be stuffed to the side in order to be compliant. Crèches and schools can send written information home to parents. Any business selling loose produce have to display the allergens near the products. Travel, such as train, plane, or boat, have to display allergen information on all packaging. All pre-packed packaging now has to have the allergen information clearly display - you'll have noticed over the last while that anything that triggers an allergy is bolded in the ingredients on the new packaging labels. As a category restaurants and takeaways include B&B's and hotels. "Written food allergen information can be placed alongside each written menu item or alternatively can be provided centrally in one or a number of conspicuous locations on the premises in hard copy or electronic format." It has to be easily located and easily understood by the customer. Everything, including sauces, condiments, and drinks, have to be declared. Additionally, all those specials on the boards have to have their allergy information updated too. Before you order a takeaway the allergen information can be provided in writing. That means either online or on the menu. Honestly, I wouldn't be ordering a takeaway if I didn't know it was safe for me before I ordered it. Cooking oil is a huge source of contamination in a kitchen. Cooking oil is considered an ingredient. There are circumstances where has to be declared. If anything containing gluten is in cooked in oil and then, say, chips are cooking in the same oil, the chips contain gluten. I have been told in restaurants that the chips are gluten free, only to find out that they are cooked in the same oil as the chips. The servers were simply under the impression that the gluten protein burns away with the heat of the oil. This is not true. These new regulations ensure that this is not a mistake a restaurant can make again with a customer. Why are restaurants saying they are not ready? An article in the Irish Times on the 8th December 2014 (click here) suggests that restaurants are not ready, but why? These regulations have been on the horizon since 2011. It is true that there are countries, including the United Kingdom, opting to verbally relay the allergen information. As a member of the allergen community I can reliably say that this will not work well in Ireland as the sole way of complying with this regulation. There are some fantastic examples of restaurants in Ireland being completely capable of doing this, but that is not 100% of restaurants all of the time. It mostly comes down to miscommunication and lack of allergen understanding. I have been witness to (and victim of) it more times than I'd like to admit. 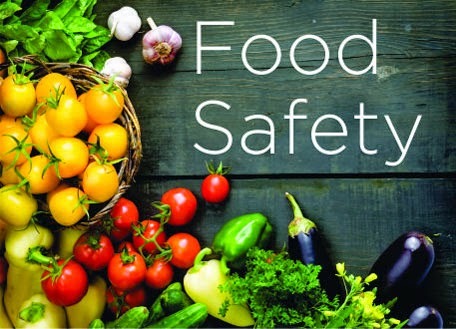 There is a consensus among restaurants that this legislation has been "sprung" upon them due to a lack of information from the Food Safety Authority. For example, I have spoken to several restaurants around the city that said they had little information, but some understood and had already implemented the new guidelines. The worrying part was a minority that said, "New legislation?!" I do have to ask why restaurants aren't ready for this? If a restaurant is not ready for this, they are not a restaurant I would be eating in and I doubt they're a restaurant anyone from the allergy community would be interested in eating in. Restaurants should already be displaying allergens on their menu. In the interim, they can produce a listing complementary to their menu while they work on their actual menu. They have to have this available Saturday 13th December 2014. What does this mean for a coeliac? Well, we're going to see wheat, oats, rye, barley, and all other derivatives that contain the gluten protein bolded in the ingredients list. The "may contain cereals containing gluten" will remain on the packaging where cross contamination may have occurred in the manufacturing process. In restaurants it means you have access to the ingredients in dishes and they have to declare cross contamination issues. This does not mean you do not have to inform the server of your dietary issues. Catch us on Facebook, Twitter, or Instagram or leave a comment below!